Don’t you love to browse the great shops in touristy towns during your summer vacations? Even if you didn’t go somewhere on vacation this year or wander through exotic home decor shops in your spare time, do you spend relaxing hours perusing those super-cute catalogs (either online or in irresistible colored print) featuring all sorts of great gadgets or home decorations? Isn’t it worth stretching the budget to have THE PERFECT dishes for your dinner party? Okay, it’s just a bathroom, but you could make it look like a spa if you only had the right accessories! The secret that I love adorable items is apparently out. These days when the major Internet shopping sites can track every view, being seduced by new stuff to replace the old stuff is easier than ever. My stack of catalogs seems to reproduce asexually during the night, and I receive “SPECIAL OFFERS” for items I am sure to love daily on my email. But I’ve run headlong into a reality check. I have too much stuff. 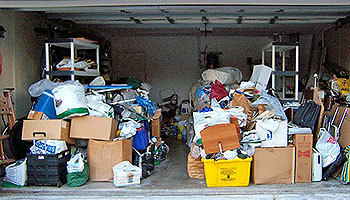 Realtors call it clutter. I know I’m not the only one who loves to collect stuff. I once saw an interview with a rock star who bragged that he buys properties—mansions and castles—simply to hold his stuff. And then there’s Hearst Castle, a monument that illustrates even art can become stuff if it’s stacked high enough. When the stuff isn’t art, a collection out of control may be called hoarding. Like many others, I donate a lot of stuff to charitable organizations, hoping someone out there needs my old dishes. I trust that the money someone pays for my nearly unwashable appetizer tray or my incredibly ugly lamp will fund good works. When some of us achieve an overload of stuff, we may even resort to throwing a garage sale—an activity that is only slightly less exhausting than moving out. As I look around my house, I know it’s too late for me to avoid the problem. But I write to those of you who’ve thus far managed to contain your urge to buy stuff, stuff, and more stuff. Don’t. I have finally reached an age when I no longer care if I have the perfect dishes or if my bathroom looks like a spa. No one comes to my home who isn’t invited, and my friends don’t care if I live in a magazine spread. My husband and I are thinking about traveling more and dusting less. At some point, we may want to downsize. We survey the room and dread the huge problem of how to get rid of all the stuff we stretched the budget to buy. Or the stuff that reminds us of loved ones—but it isn’t the loved ones; it’s stuff. So, buyer beware. The finds you treasure today will one day look suspiciously like clutter. Use your money for fun—not stuff. Memories don’t collect dust. This entry was posted on August 21, 2014 by Personal Journeys with Gramma in Musings and tagged Abundance, Clutter, Creating Memories, De-Cluttering, Decorating, Experiences, featured, Hoarding, Live in the Moment, Living for Fun, Memories, Musings, Organization, Overwhelming, Possessions, Stuff, Treasures.